This beautiful Irish harp pendant is cast in sterling silver. It has a simple Irish design. The top of the harp appears wider and a swirl sits at the bottom. Celebrate your love of Ireland with our national symbol. A wonderful gift for yourself or for someone you love. 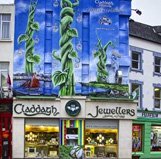 Claddagh Jewellers – The Celtic Jewellery Specialists - From Galway with Love!